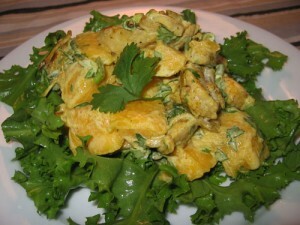 Curried Chicken And Yogurt Salad recipe by Nazia Nazar at DesiRecipes.com. Mix together the mayonnaise, curry powder, salt , pepper, and chili oil. and stir in the cubes of cooked chicken . Serve on a bed of fresh green salad vegetables.